As part of Aurora, the women-only leadership development programme, City has welcomed academic and professional staff from across the UK to a series of action learning sets hosted at the University. Ten participants from City joined women from across the higher education sector to attend the sessions, where they had the opportunity to discuss work-related challenges and identify solutions. City is committed to gender equality and has pledged to support Aurora by providing mentors, role models and Aurora Champions and by nominating City staff members to take part in the programme. Assistant Director of Quality and Academic Development at City, Alison Edridge joined Aurora as a way to develop her leadership skills and to increase her confidence as a leader. Alison said the programme has already helped her to identify areas she can develop in order to be successful. 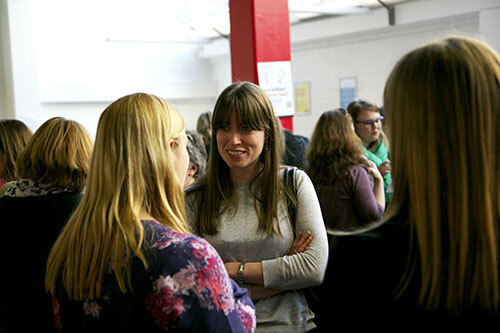 Laura Hames, Finance Officer at The University of Exeter attended the event held at City. Commenting on her visit to Northampton Square, Laura said: “I loved my visit to City University London yesterday. The location is perfect, a quiet enclave right in the heart of London. There is no doubt that the higher education sector, like other areas of society, needs to take steps to increase the number of women in senior leadership roles. At City, we are committed to making progress in this regard and Aurora is one of the means by which we hope that we can improve. Elizabeth Huckle, Senior International Student Adviser at City said: “Participating in the Aurora programme has given me an opportunity to develop my skills as a manager and to think about what it means to be a ‘leader’ within the University. It has been fantastic to meet and network with so many inspirational women within the sector. Aurora is a leadership development initiative, developed by the Leadership Foundation for Higher Education that combines education, mentoring and on-line resources to provide learning with a more enduring impact. Aurora provides an additional opportunity for women to influence their institutions and to develop leadership skills.